Apparently, I am a poor challenge participant this go-around! I'm loving all of the outfit suggestions; however, since I was off work last week, my outfits leaned more towards super casual as opposed to 'work appropriate'. I returned to work yesterday, but forgot to take a picture. And there you have it. I will endeavor to be a little more diligent with my picture taking in the coming week... but as usual, no promises. It's hard to follow the challenge when you aren't working. I still love that yellow and of course today the day I could have worn my new yellow one, I'm not working!!! That sparkly tank is so cute and right up deenas alley. Be careful she doesn't try to steal it!!! hahah I totally thought of Deena when I put it on! 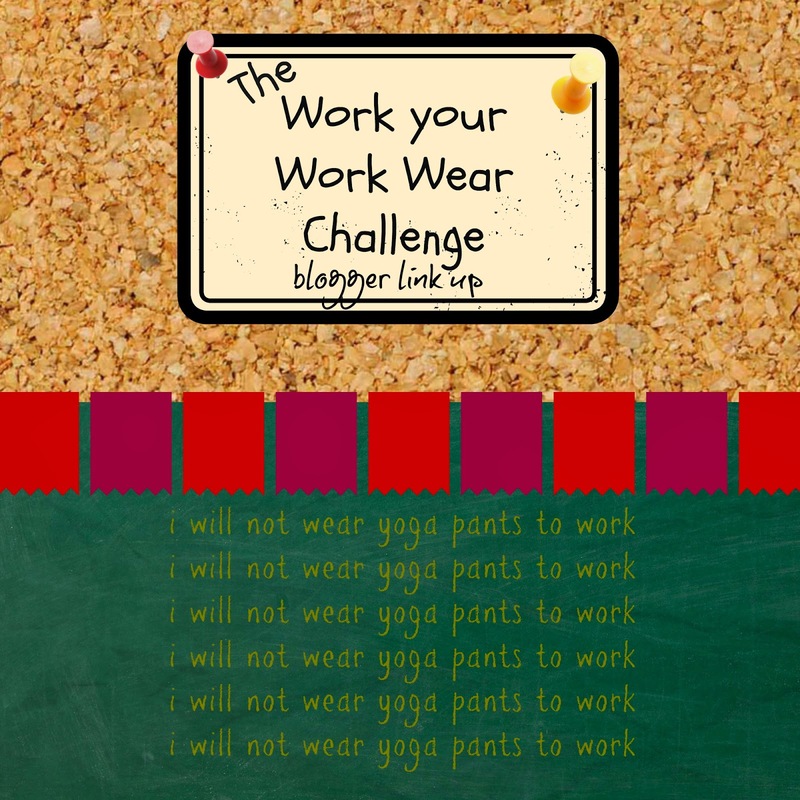 Workwear or not, they are all great outfits! Love the mustard top with the leopard flats and your fun sparkly tank! 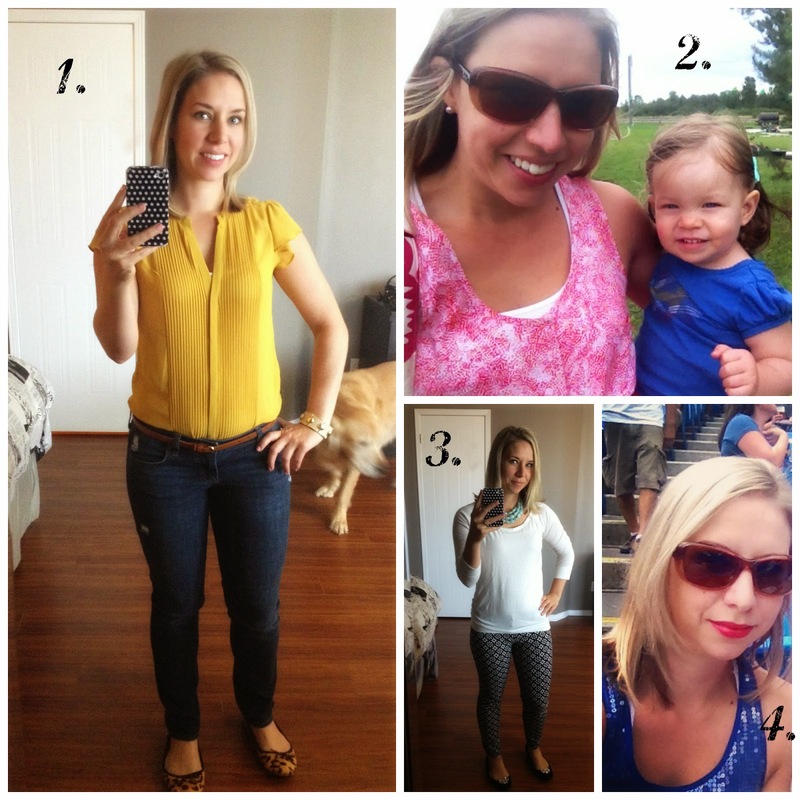 I really love #1, the mustard color of that top is perfect for the fall! #2 is my second favorite with the patterned pants. thanks Carrie!! I think I need more mustard in my life/closet! lol! I wasn't sure about #3 but it was super comfortable for running errands! Love that yellow shirt on you! Looks great! Now I"m wishing I did the challenge, darn! we miss you this go around, but you'll be back :) it's so addictive! thanks Marta! I'm loving the mustard color! My favourite is the blue sparkly Jays' number and that you were there and that they won and that it was Jeter's last game there. We NEED to do a T.DOT girls trip next year. YES please to the girls trip!!!!!!!!!! I loved your Blue Jays top, too. We are die-hard Cincinnati Reds fans at my house and I have several cute Reds tee shirts but nothing as hot and sassy as your Blue Jays bling! Super cute! I think you could rock a Cincinnati sparkly shirt Leslie! So pretty! Love the mustard top on you. Your daughter is SO adorable. I think she's pretty cute too but I'm a tad biased! On challenge or off, super cute looks! Love the printed pants and the mustard top!! Love that yellow H&M top! So perfect for fall! Click and Chat Social Media Link Up! what I wore - FALL!! Click and Chat Social Media Link up Party!